The modified ATR indicator presented in the article is available in the TASCIndicator library 1.0.7.0 and up. Here we provide the WealthScript code to enter a discretionary position, long or short, on the open of a specified date given by the Strategy Parameters. 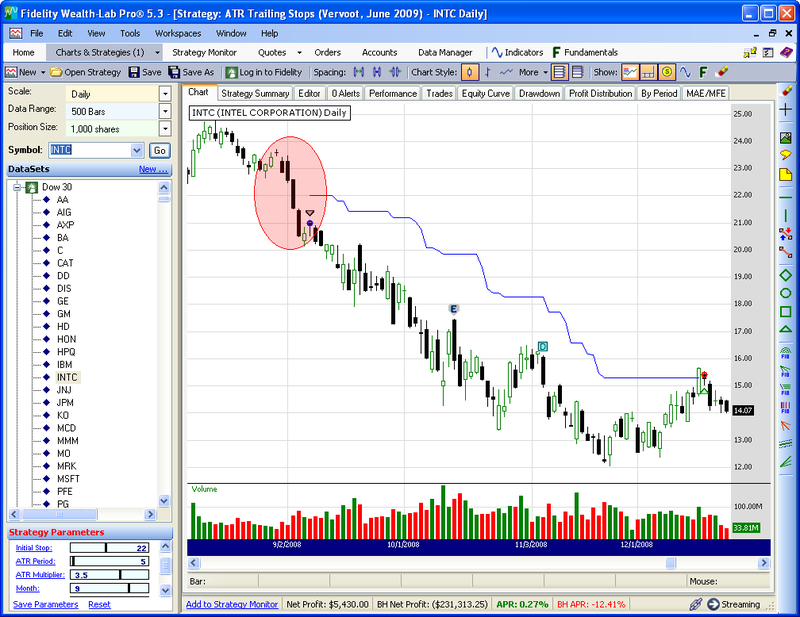 Included is the ATRTrail class, which utilizes the modified ATR to calculate a trailing stop based on the most-recent close. You can use it with any of your Strategies. Once you create an ATRTrail object, just pass the bar number to the ATRTrail.Price method. As with last month’s article, if you prefer to use touch stops, then WealthScript’s built-in ExitAtTrailingStop method is convenient. Figure 1. INTC’s three black crows following a doji-island reversal made a nice setup to enter short with a relatively tight stop at the center of the pattern.